I first saw the trailer for (and heard about) Blindspotting before Upgrade. That is also when I first saw a Sorry To Bother You trailer. A pretty intense set of movies. From absurd to realistic, they all have similar themes. Okay. Upgrade really doesn’t. But Sorry To Bother You deals with race, acceptance, and fucked up governments. Maybe in a more extreme manner. Blindspotting is aiming to be more realistic. And I was very excited to see it starting Daveed Diggs. Like most people, I was introduced to him from Hamilton as Lafayette/Jefferson. Since then he has been in a good amount, which is surprising of Broadway actors. He had a role in Wonder, Unbreakable Kimmy Schmidt, Black-Ish, and Ferdinand. But these are all straight up comedies, or who cares roles. This is a movie where Diggs should be acting and maybe making us cry. He would make me cry if he ever cut that hair off. Collin (Daveed Diggs) was in jail for two months for a felony charge. It involved a fight, and some fire. After jail, he has a whole year of probation. You know, staying in the county that houses Oakland, California (where he was already living, and his mother lives, thankfully). He has curfew. He can’t be involved in any criminal activity. He has to live at a halfway house as well. Just normal probationary things. And with three days left on his probation, almost a “free” man (with a glaring felony tag that will follow him throughout his life), while returning home he gets to see a police shooting. Right in front of his work vehicle, a cop firing four shots on a running black man who dies quite unceremoniously. And he has to get home before curfew, but he saw a guy get straight up murdered by the police. Was it because he was black? Was it because of an actual threat to society? Was it because he looked at a gentrifying white hipster the wrong way and get involved in stuff way over his head that escalated beyond any one person’s comprehension levels? Is Collin speaking from experience? Collin just wants to survive. Survive in the city that he was born and raised that is changing for the worse. A city where he feels like he is being kicked out, or killed out, so that others can take his place and make it “better”. He wants to hang out with his life long friend, Miles (Rafael Casal), but Miles might be considered a bad influence on him. And well, he is white and can probably get away with more. Collin fears the future. Collin doesn’t know where his life is going, but he knows where he wants to be. Safe, alive, and free. Also starring Janina Gavankar, Jasmine Cephas Jones (the original Peggy from Hamilton), Tisha Campbell-Martin, Utkarsh Ambudkar, and Ethan Embry. Wanna know how I know where he is from? 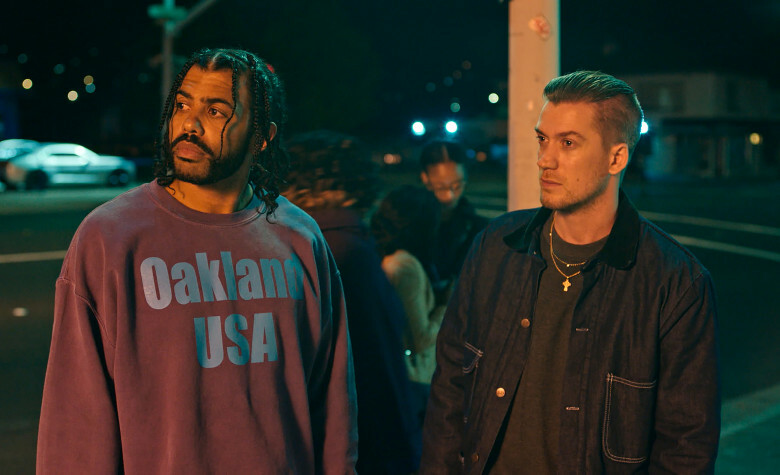 Blindspotting is an example of a good comedy drama. It has heightened elements of both without feeling jarring. It is funny, like a good comedy, and it is tense and real, like a good drama. One side does not harm the other in the slightest. It just feels realistic and important and realistic and important. The director, Carlos López Estrada, hasn’t done anything this big before, but what really sells this movie are the leads, Diggs and Casal. It should be noted that these two are actual real life friends, Diggs from Oakland, Casal from Berkley, wrote this script over almost a decade. They wanted to portray the area in a way that was being overlooked. They wanted to highlight the changing identities of that area of California, the problems with police brutality, racism, and of course gentrification, the latter issue which is in no way subtle. They hit all of these points and they hit them naturally. This film flows so well, it is like a rap song, if I understood rap songs. Part of me is saying that just because rap is heavily influenced in the script and dialogue. The ending is really what sells this film. The “final” confrontation that was definitely unexpected. There were plenty of good scenes before that as well, especially the phone call, the post party scene, the flashback, and more. But the ending is powerful and one that will be played over and over again once the film gets to that point of internet digestion.